Stay puts are also called Pin Frogs. They are a small weighted piece of round or square metal that has a bed of nails. These are used in the base of arrangements and flowers are secured directly onto the flowers. Typically this is used in Ikebana floristry work and designs. Over time, this has been replaced by floral foam. 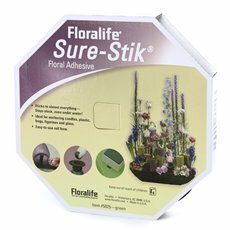 Sure Stick® is plasticine or clay style of adhesive that is extremely sticky and will glue almost anything. It is waterproof and will hold most material together. It can be reused and is easy to separate once used. A typical application might be using it on the underside of a ceramic figurine that you want to secure in the base of a ceramic bowl. Ikebana Supplies Australia. Ikebana Supplies Sydney, Ikebana Supplies Melbourne, Ikebana Supplies Brisbane, Ikebana Supplies Canberra, Ikebana Supplies Perth, Ikebana Supplies Adelaide, Ikebanba Supplies Darwin, Ikebana Supplies Hobart.